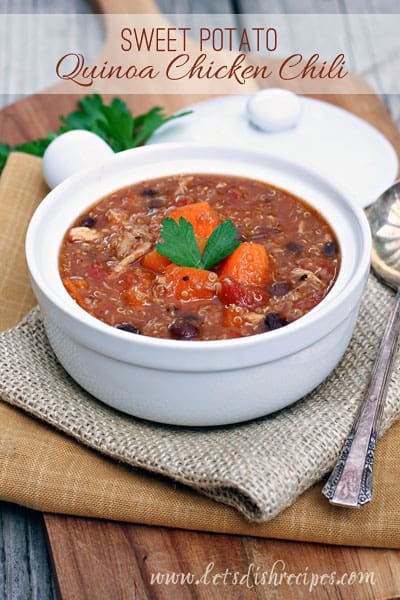 There is nothing I love more on a chilly evening than a hearty, healthy chili simmering in the slow cooker. 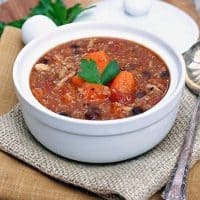 This chili is loaded with nutritious ingredients like sweet potatoes, quinoa and black beans, and seasoned with Southwestern spices for a unique and delicious meal. I happily ate the leftovers for lunch for several days and it just seemed to get better and better. And the best part, it’s so easy. Just throw everything in your slow cooker and walk away! I use a rotisserie chicken for this recipe, which calls for cooked shredded chicken, but you could certainly start with whole, uncooked chicken breasts. Just let them cook right in the slow cooker with the rest of the ingredients, then pull them out and chop or shred them shortly before serving. This is great with traditional chili toppings, like sour cream and cheese, but I honestly prefer it without, so do whatever suits your tastes! Add everything but the salt and pepper to a lightly greased slow cooker. Cook on low for 6-8 hours, stirring occasionally. Just before serving, season with salt and pepper, to taste. Who Dished It Up First: Adapted from Chelsea’s Messy Apron.